"Swiss Brown" redirects here. For Brown Swiss the cattle breed, see Brown Swiss cattle. Agaricus bisporus is an edible basidiomycete mushroom native to grasslands in Europe and North America. It has two color states while immature—white and brown—both of which have various names. When mature, it is known as portobello mushroom (also portabella or portobella). When immature and white, this mushroom may be known as common mushroom, button mushroom, cultivated mushroom, table mushroom, crimini mushroom and champignon mushroom. When immature and brown, it may be known variously as Swiss brown mushroom, Roman brown mushroom, Italian brown mushroom, cremini/crimini mushroom, or chestnut mushroom. A. bisporus is cultivated in more than seventy countries, and is one of the most commonly and widely consumed mushrooms in the world. The common mushroom has a complicated taxonomic history. It was first described by English botanist Mordecai Cubitt Cooke in his 1871 Handbook of British Fungi, as a variety (var. hortensis) of Agaricus campestris. Danish mycologist Jakob Emanuel Lange later reviewed a cultivar specimen, and dubbed it Psalliota hortensis var. bispora in 1926. In 1938, it was promoted to species status and renamed Psalliota bispora. Emil Imbach (1897–1970) imparted the current scientific name of the species, Agaricus bisporus, after the genus Psalliota was renamed to Agaricus in 1946. The specific epithet bispora distinguishes the two-spored basidia from four-spored varieties. The pileus or cap of the original wild species is a pale grey-brown in color, with broad, flat scales on a paler background and fading toward the margins. It is first hemispherical in shape before flattening out with maturity, and 5–10 centimetres (2–4 inches) in diameter. The narrow, crowded gills are free and initially, pink, then red-brown and finally a dark brown with a whitish edge from the cheilocystidia. The cylindrical stipe is up to 6 cm (2 1⁄3 in) tall by 1–2 cm wide and bears a thick and narrow ring, which may be streaked on the upper side. The firm flesh is white, although stains a pale pinkish-red on bruising. The spore print is dark brown. The spores are oval to round and measure approximately 4.5–5.5 μm × 5–7.5 μm, and the basidia usually two-spored, although two-tetrasporic varieties have been described from the Mojave Desert and the Mediterranean, with predominantly heterothallic and homothallic lifestyles, respectively. This mushroom is commonly found worldwide in fields and grassy areas following rain, from late spring through to autumn, especially in association with manure. It is widely collected and eaten, even by those who would not normally experiment with mushroom hunting. The common mushroom could be confused with young specimens of the deadly poisonous destroying angel (Amanita sp. ), but the latter may be distinguished by their volva or cup at the base of the mushroom and pure white gills (as opposed to pinkish or brown of A. bisporus). Thus it is always important to clear away debris and examine the base of such similar mushrooms, as well as cutting open young specimens to check the gills. Furthermore, the destroying angel grows in mossy woods and lives symbiotically with spruce. A more common and less dangerous mistake is to confuse A. bisporus with Agaricus xanthodermus, an inedible mushroom found worldwide in grassy areas. A. xanthodermus has an odor reminiscent of phenol; its flesh turns yellow when bruised. This fungus causes nausea and vomiting in some people. The poisonous European species Entoloma sinuatum has a passing resemblance as well, but has yellowish gills, turning pink, and it lacks a ring. The earliest scientific description of the commercial cultivation of A. bisporus was made by French botanist Joseph Pitton de Tournefort in 1707. 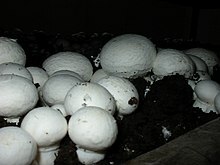 French agriculturist Olivier de Serres noted that transplanting mushroom mycelia would lead to the propagation of more mushrooms. Originally, cultivation was unreliable as mushroom growers would watch for good flushes of mushrooms in fields before digging up the mycelium and replanting them in beds of composted manure or inoculating 'bricks' of compressed litter, loam, and manure. Spawn collected this way contained pathogens and crops commonly would be infected or not grow at all. In 1893, sterilized, or pure culture, spawn was discovered and produced by the Pasteur Institute in Paris, for cultivation on composted horse manure. Today's commercial variety of the common mushroom originally was a light brown color. In 1926, a Pennsylvania mushroom farmer found a clump of common mushrooms with white caps in his mushroom bed. As with the reception of white bread, it was seen as a more attractive food item and became very popular. Similar to the commercial development history of the navel orange and Red Delicious apple, cultures were grown from the mutant individuals, and most of the cream-colored store mushrooms marketed today are products of this 1926 chance natural mutation. A. bisporus is now cultivated in at least seventy countries throughout the world. Global production in the early 1990s was reported to be more than 1.5 million short tons (1.4 billion kilograms), worth more than US$2 billion. In a 100-gram serving, raw white mushrooms provide 93 kilojoules (22 kilocalories) of food energy and are an excellent source (> 19% of the Daily Value, DV) of the B vitamins, riboflavin, niacin, and pantothenic acid (table). Fresh mushrooms are also a good source (10–19% DV) of the dietary mineral phosphorus (table). While fresh A. bisporus only contains 0.2 micrograms (8 IU) of vitamin D as ergocalciferol (vitamin D2), the ergocalciferol content increases substantially after exposure to UV light. Some mushrooms contain hydrazine derivatives, including agaritine and gyromitrin, that have been evaluated for carcinogenic activity. Agaritine, a hydrazine, poses no toxicological risk to humans when mushrooms are consumed in typical amounts. ^ Imbach EJ (1946). "Pilzflora des Kantons Luzern und der angrenzen Innerschweiz". Mitteilungen der naturforschenden Gesellschaft Luzern (in German). 15: 5–85. ^ GourmetSleuth (11 November 2013). "Portobello (Portobella) Mushrooms". Gourmet Sleuth. Retrieved 9 January 2019. ^ a b c Cappelli A. (1984). Fungi Europaei:Agaricus (in Italian). Saronno, Italy: Giovanna Biella. pp. 123–25. ^ Cooke MC (1871). Handbook of British Fungi. 1. London: Macmillan and Co. p. 138. ^ "Species Fungorum – Species synonymy". Index Fungorum. CAB International. Archived from the original on 10 June 2011. Retrieved 21 January 2010. ^ Lange JE (1926). "Studies in the agarics of Denmark. Part VI. Psalliota, Russula". Dansk botanisk Arkiv. 4 (12): 1–52. ^ Schäffer J, Møller FH (1939). "Beitrag zur Psalliota Forschung". Annales Mycologici (in German). 36 (1): 64–82. ^ Zeitlmayr L (1976). Wild Mushrooms:An Illustrated Handbook. Garden City Press, Hertfordshire. pp. 82–83. ISBN 0-584-10324-7. ^ a b Carluccio A. (2003). The Complete Mushroom Book. Quadrille. pp. 21–22. ISBN 1-84400-040-0. ^ Callac P, Billette C, Imbernon M, Kerrigan RW (1993). "Morphological, genetic, and interfertility analyses reveal a novel, tetrasporic variety of Agaricus bisporus from the Sonoran Desert of California". Mycologia. 85 (5): 835–851. doi:10.2307/3760617. JSTOR 3760617. ^ Callac P, Imbernon M, Guinberteau J, Pirobe L, Granit S, Olivier JM, Theochari I (2000). "Discovery of a wild Mediterranean population of Agaricus bisporus, and its usefulness for breeding work". Mushroom Science. 15: 245–252. ^ Spencer DM (1985). "The mushroom–its history and importance". In Flegg PB, Spencer DM, Wood DA (eds.). The Biology and Technology of the Cultivated Mushroom. New York: John Wiley and Sons. pp. 1–8. ISBN 0-471-90435-X. ^ Chang ST (1993). "Mushroom biology: the impact on mushroom production and mushroom products". In Chiu S-W, Buswell J, Chang S-T (eds.). Mushroom Biology and Mushroom Products. Hong Kong: Chinese University Press. pp. 3–20. ISBN 962-201-610-3. ^ "Mushrooms and vitamin D". Los Angeles Times. Retrieved 23 August 2003. ^ Koyyalamudi SR, Jeong SC, Song CH, Cho KY, Pang G (April 2009). "Vitamin D2 formation and bioavailability from Agaricus bisporus button mushrooms treated with ultraviolet irradiation". Journal of Agricultural and Food Chemistry. 57 (8): 3351–5. doi:10.1021/jf803908q. PMID 19281276. ^ Hashida C, Hayashi K, Jie L, Haga S, Sakurai M, Shimizu H (June 1990). "[Quantities of agaritine in mushrooms (Agaricus bisporus) and the carcinogenicity of mushroom methanol extracts on the mouse bladder epithelium]". Nippon Koshu Eisei Zasshi (in Japanese). 37 (6): 400–5. PMID 2132000. ^ Roupasa P, Keogh J, Noakes M, Margettsa C, Taylor P (April 2010). "Mushrooms and agaritine: A mini-review". Journal of Functional Foods. 2 (2): 91–8. doi:10.1016/j.jff.2010.04.003. Genders, Roy (1969). Mushroom Growing for Everyone. London: Faber. ISBN 0-571-08992-5. 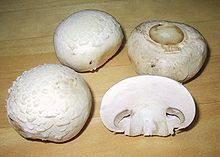 Wikimedia Commons has media related to Agaricus bisporus. This page was last edited on 24 April 2019, at 06:32 (UTC).